While still spraying weeds every morning, the grass cutting has slowed (the riding mower is still in pieces awaiting parts), my house is fairly clean and I found myself with some spare time this afternoon. I have a stack of ten or so quilt tops of my own waiting to be quilted. The three pieces on top of the pile happened to be two small wall hangings and a small table runner. I’m not picky about quilt backings–neutral, solid color and I’m good. So, I cut a narrow piece of backing and loaded all three small pieces in a row–I only had to pin one piece of backing to the two zippers instead of three separate, small backing pieces. Each of these pieces requires some stitching in the ditch–I use clear thread for this stitching and I can now jump from one piece to the next. As you can see the horse on the quilt is going a different direction than the one on the panel I’m currently quilting. When I realized my mistake, I just made another panel for the quilt and kept the one with the horse running the wrong way. It will make a cute little wall hanging. The fish is from our southeast Alaska ferry trip with Geri and Larry–I found the pattern and fabrics in quilt shops along the way. The table runner pattern and fabric was given to me by my sweet sister on a birthday. It’s almost embarrassing to tell you how long these two pieces have been waiting for quilting–I pieced both at the last Iron Maiden quilt retreat I attended in the fall of 2014–well now!! Rainy and cool has been our weather pattern for the last few days. The Cowboy would really like to finish cutting our hay–but we don’t want to wish it would stop raining just yet! He’s been working on the bathtub remodel project and cleaning out the solar trailer. We still don’t have the new to us Roadmaster trailer–RVing folks, run those generators!! This Onan generator had not been started in almost two years. The owner of the trailer promised he would get the generator going before we paid for the RV. Jim tried and tried yesterday with no luck–but he does have some luck–his wife Tracy works for the Cummins shop in Billings and the RV is there getting its sick generator repaired. Seems it needs a new carburetor which was to have been delivered overnight–nope–hopefully the part will come Friday. It’s very important to run your generators and most generator repair people say run them under load–check your manual and follow those directions to avoid a costly repair. Went to a quilt and textile center the other day and none were as wonderful as what you show me! I’m sure there’s a reason the horse needed to be going that direction? Thanks for the generator reminder – it’s been too long for ours! That’s so sweet of you to say Jodee! And last night I was laughing at myself for being so attentive to which direction the horse went–but now I will have a cute little wall hanging! One day I would love to come to Montana and see your whole quilting machine. This process has me baffled. Looks like three beautiful pieces. We just ran our generator on our way to Port Angeles with a load. We run our two electric heater and if it gets to hot we turn on the A/C to create the load. Well, you and John just mosey on over this way–and I will show you the process! It’s funny you guys are still running heat and so are we while the rest of the poor country swelters. I’m not getting my hopes up too high–I am sure we will have some miserable weather in July and August! Our generator in the Country Coach had also been used very little when we bought the coach and that thing started every single time–we would run it while going down the road with both air conditioners on. The only time it didn’t start was when one of the out of control population of North Ranch rabbits ate the wiring! A beautiful sky photo! I’m sure it was better in person. I like when mistakes happen , sometimes it’s an opportunity for another creation, even better than your original sewing project! You have the best attitude Geri!! 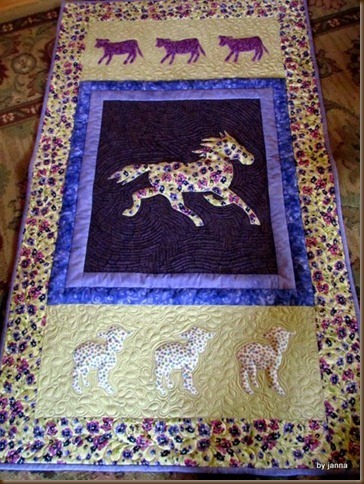 Your quilting projects are amazing. Makes me REALLY want a long arm. Interesting about the generators. Tom bought a new one and has been running it non stop – or so it seems. Told me this morning he has enough hours on it so he can now change the oil. Hmmm🤔🤔🤔🤔. We haven’t even “used” it yet…. Thanks Sandy–just some little projects which had been hanging out in the closet with all my other un-quilted projects! :))That’s funny about Tom and the generator. Evidently our new to us generator in the new to us trailer is fixed and we will go get it tomorrow. Good thing our generator was operational. Our power was out for over two hours, so we put it to use. Not sure what the problem was. We used our little portable Honda generator this spring when our power was out for almost 24 hours!! Love your quilting. It’s beautiful. My late husband drove an RV in his business. He had an ON AN generator. I remember many nights trying to get that darn stubborn thing to start! Drove me crazy and I hated the noise. It didn’t put me to sleep. It kept me awake. The sunset pic is so gorgeous! Don’t work too hard and enjoy the 4th of July! We seldom run our generator(except for its health! :))))–with the solar on top of the big trailer we haven’t had to use a generator. Hopefully Michael will install solar on the roof of this new trailer–soon?? ?